Coffee and Chitchat – Welcome to our website! We are coffee and conversation addicts, so we decided to create something out of what we do best, which is chat. We are a mother-in-law and daughter-in-law duo, who just happen to get along famously! Share in our conversations, which will go down many paths. You will be surprised at where we might go, but it will always be an interesting ride! Coffee and Chitchat and Some of Our Favorite Chicago Things! Join us today as we talk about some of the things we love about Chicago! Forewarning, it’s mostly food-related. The Windy City has a lot to offer, but so do the Western Suburbs. We’ll discuss a few of these gems and more! We also had a special guest listen in, and, yes, contribute to a little of our conversation. If you’re in Chicago, stay warm and be assured that after this snowy day, the Weather Channel tells us it will be 70 degrees on Tuesday! Only in Chicago, right? Coffee and Chitchat and Welcome Back from Vacation! We feel like we haven’t recorded in a million years! Turns out it was just two weeks, so hit play on your podcast app! We truly wind through a lot of different topics in our conversation today. Metal detectors, a desert in Wisconsin, cemeteries, veterinarian shows and road trips are all on the gamut today. 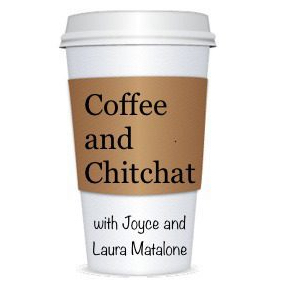 This is truly what a Joyce and Laura conversation sounds like, so enjoy your Sunday as you take a listen! Looking to listen to something fun and grab some helpful tips along the way? Well, then this episode is for you. You’ll also get a true Joyce and Laura conversation. What weird habit did a co-worker of Joyce partake in? You’ll find out. Also, listen for Dominic’s rendition of God Bless America and lots of Chewy noise in the background! Coffee and Chitchat and Happy Spring! Wondering what today’s episode is about? Well, after a week off, thanks, daylight savings time, we were inspired by the fact that all of our snow has finally melted! Listen today as we discuss some VERY interesting things people have discovered after a long winter. I think you’ll be able to tell which one was our fave! Sit back and enjoy a green beer on us and Happy St. Patrick’s Day from Coffee and Chitchat! Coffee and Chitchat and Comfort Food! Whether it’s Mac and Cheese or Rice Pudding, everyone has their favorite comfort food. Well, let’s be honest, some of us have a number of foods that gives us comfort! Why? Well there’s some actual science behind it. Take a listen and we try to navigate through the psychology of it and add some sidebars in between. It wouldn’t be our podcast if we didn’t stray off topic. Grab your favorite comfort food and take a listen! Do us a solid and boogie down to tonight’s episode! In its heyday, Studio 54 was quite the club! Although Steve Rubell was no genius, he did make this old studio set the place to be in NYC! Hear some stories about the club in the late 70’s and how it met with its ultimate and inevitable demise. Relax with your favorite beverage, take a listen and we’ll catch you on the flip side! Coffee and Chitchat and Espionage! Grab your trench coat, tape a recording device to your chest and join us for today’s episode about two famous spies. You may not know the story of Shi Pei Pu, but get ready for a wild ride! Then, take a listen to the story of one of the most notorious spies, Mata Hari! We promise this episode is a real gem and we had lots of laughs! Binoculars and hidden cameras optional!